Apple Season is now upon us here in New England and what better way to get the apple rolling than some original, Yankee recipes using our favorite orchard fruit? Having spent a few hours at Treworgy's Orchard here in Levant, Maine, I came away with some fantastic apples and I highly urge all to take a trip, even if you have to drive a little ways. This place is perfect if you have little ones. 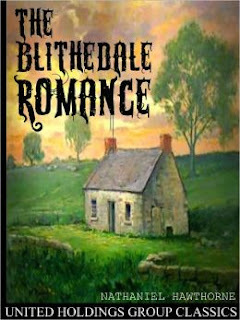 Check them out at http://treworgyorchards.com/. 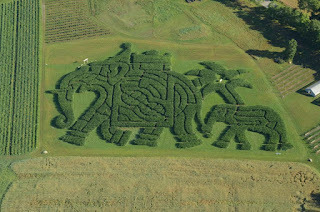 Check out their corn maze this year, such fun. Without going on and on(much like I did in my previous post), let's start peeling. And if you have any questions about certain apples for any recipe you are preparing, simply ask them. They are the single friendliest people as well as 100% child friendly, which is the mitigating factor for me visiting year after year. These little treats are perfect for that after school snack, sitting on the deck at twilight or curled up watching your favorite movie. The coating is a little tricky but by placing some of the oat mixture in the palm of your hand, then an apple piece, topped with more oats, simply squash together with both hands while rotating the apple a couple of times. Preheat oven to 350-degrees F. In a shallow bowl, combine sugar, flour, oats, cinnamon and nutmeg. Add the butter and mix until all dry ingredients are moistened. Add egg whites to a shallow bowl and whisk well. Cut apple quarters into 4 evenly sized pieces, about an inch on all sides. Add a quarter of the apple slices into egg whites, stir to coat. Lifting out one apple piece at a time, shake excess egg white off and dip in oat mixture. Press dry coating into all sides of apple firmly and place on a dry baking sheet. Continue until all apples are coated. Bake 13-15 minutes, or until apple is softened when pressed and the coating has become crispy, turning over halfway through baking to brown on all sides. Remove from oven and serve warm with whipped topping for dipping. My favorite vehicle for these poached apples is a simply grilled pork chops and unpretentious, freshly cooked green beans. But if I were to enjoy these wine-infused apples as a dessert, the answer is yet another simple presentation.....ladled hot over real vanilla bean ice cream. Peel, core and cut apples in 8 wedges each. Place apples in a large bowl, add remainder of ingredients and toss to combine well. Cover and refrigerate for one hour, stirring frequently. Transfer apple mixture to a large skillet over low heat. 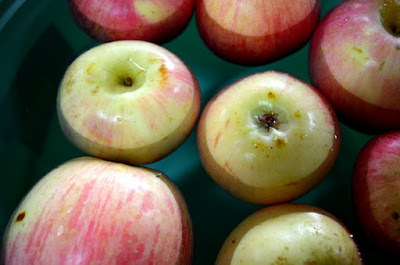 Once the wine is hot and slightly simmering, let apples cook until they are crisp tender, about 15-17 minutes. Remove apples with a slotted spoon to enjoy over your protein or ice cream. *Red Bordeaux, red Beaujolais or Pinot Noir are highly recommended for this recipe. Although hard apple cider is less sweet(ordinarily)than non-alcoholic apple cider, you can substitute one for the other in this recipe. Simply add a pinch or two of salt over pork before cooking if desired. The hard apple cider, I might add, will tenderize the pork much more efficiently than ordinary cider. In a large, shallow bowl, blend cider and lemon juice. 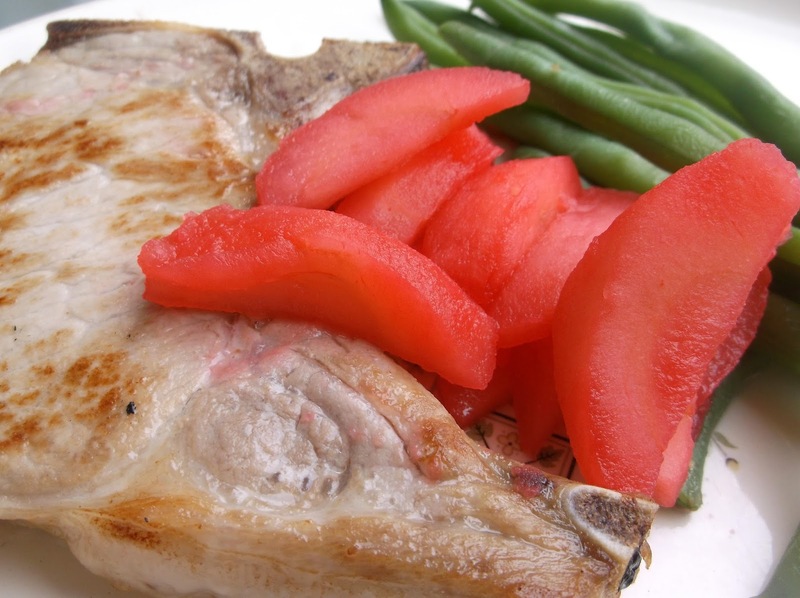 Add pork chops, cover with film wrap and refrigerate at least 4 hours. Turn chops a couple times while marinating. Melt half the butter in a large skillet over medium-high heat. Add apple wedges and cook about 6-7 minutes, or until browned and almost completely tender. Remove pan from heat and set aside. Meanwhile, remove pork from marinade onto a plate; set pork aside. 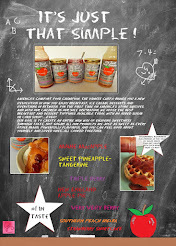 Transfer marinade to a blender or food processor with the cooked carrots, vegetable broth, maple syrup and cornstarch. Pulse on high until as smooth as possible. Transfer to a saucepan and boil over medium-high heat until reduced by half. 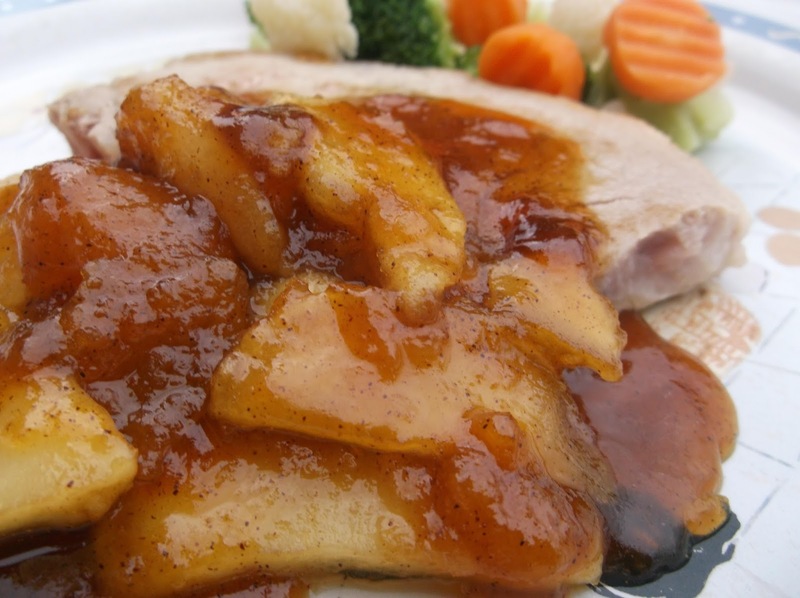 Add reduced marinade to skillet with cooked apples and bring to a simmer while cooking pork. Add remainder of butter to a large skillet over medium heat and cook pork until no longer pink in the middle. Heat California-style vegetables until hot according to package directions. Serve 1 pork chop per person, topped with a quarter of the cooked apples in Golden Cider Gravy and equal amounts of vegetables. Okay, okay! I know I have repeatedly 'repeated' that I would not use alcohol in recipes because of my love of everyone(especially children)enjoying my recipes. But I had a weak moment and being a Yankee, I adore anything apple. So, because I thought our beloved Apple Jack liquor would be far too potent for this Russian street food, I chose the deliciously different apple liqueur. For those of you who do not want any alcohol, simply replace with melted, whisked apple jelly or even mint jelly. In a large bowl, add apple juice, 2 tablespoons brown sugar and yeast. Stir well and let sit 10 minutes. Meanwhile, in a medium saucepan, add diced apples and enough water to cover. Over medium heat, cook until apples are crisp tender, about 5 minutes. Remove, strain, transfer to a bowl. Stir in apple liqueur and refrigerate until needed. After 10 minutes, stir 2 cups flour, oil and salt in the yeast mixture. Using a wooden spoon, continue stirring until it begins leaving the side of the bowl. Loosely cover with a cloth and place in a warm spot to rise for about an hour, or until almost double in bulk. On a well floured work surface, empty dough and knead for 2-3 minutes, or until elastic feeling and it is no longer sticky. Divide into 12 equal pieces. Grease a baking pan with nonstick cooking spray; set aside. Remove cooked apples from refrigerator and stir in apple liqueur; set aside. Flatten out a dough ball until it is about 3 inches in diameter. Place a tablespoon of apple mixture in the center and pinch until it is sealed. Place, sealed side down, on prepared baking pan. Repeat with remainder of dough and apple mixture, leaving 3 inches between each filled dough ball. Brush the top of each with beaten egg and place in cold oven. Turn heat to 350-degrees F and bake 30-32 minutes, or until lightly browned on top. The filling may ooze out on top, but that is fine. Remove from oven to a plate or rack to cool slightly before serving or cool completely. This is just the beginning. A couple more trips to Treworgy's over the next couple weeks will certainly result in more Yanked recipes. As New England as Apple.......Just Apples! Apples have been more closely associated with New England than any other fruit and any other state, second only to pumpkin. Our Yankee heritage was literally raised on everything apple. From cider(hard and "soft")to sauce to pies, apples(in the form of applesauce) were even used in place of fat in cakes much of the time, as we have just "rediscovered". 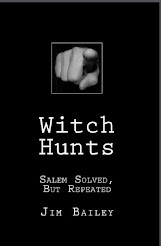 Two of the favorites among the Puritans and colonists in New England was "apple sass" and dried apple pie. 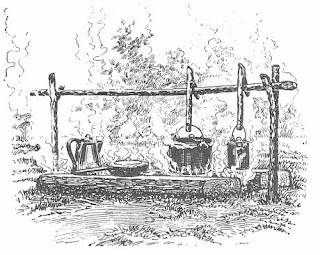 "Apple Sass" was a dish that was exactly the same as making apple butter(see below) but was stopped in the middle stages. 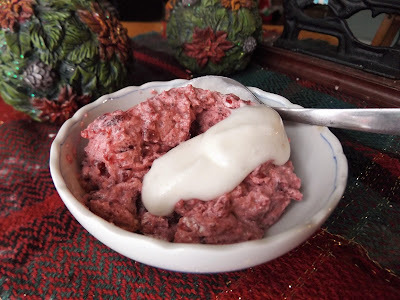 It was always made in the fall and kept in a barrel right outside the front door so that any child, when told to do so, would simply open the door and scrape out a chunk of frozen "apple sass", bring it in and everyone would enjoy it once thawed. Dried apples were made into pies when it was off season. It was dried as pumpkin, peeled and thinly sliced before stringing on a long twine to hang above the fireplace mantel to dry. 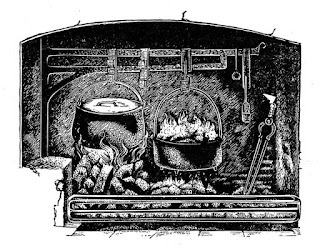 When a pie was ready to make, they would be taken down, boiled in water to hydrate and made into pie, cobbler, crisp, Betty or a wide range of goodies. There have been many myths about when apples were first brought to America and by whom. 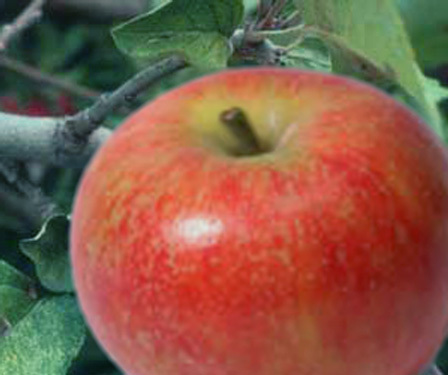 Many still believe that it was Johnny Appleseed or some botanist in New York who first planted cultivated apple trees. Neither, of course, is true. Although many of you may find this a little boring, being a book-a-holic and a lifelong lover of anything New England, I love to spread the word about anything Yankee, and apples just happens to be part of who we are. Crabapples have been part of the original(Native)Americans diet long before we set foot on these shores. Sure, we have all tasted them, but most of us have spit it out just as fast. Sour, bland and even astringent can be easily attributed to many species of these small apples. In order to overcome this, the Indians used to throw them in the fire, as is, and let them roast until fairly soft. Taking them out to cool and eating them as is was truly a sweet treat in the days of no sugar. Over time, even before the landing of any European, apples were stewed with fish and game, along with pumpkins and edible greens found growing abundantly everywhere. This is not to say that sweeter, larger wild apple varieties didn't grow on these shores before the arrival of the English. Although all historians concur that sweet apples were not to be found, this is untrue. 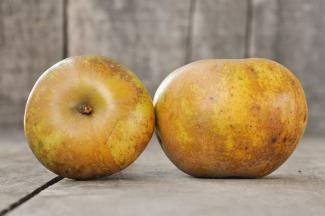 See the story of the Baldwin apple below. If the Baldwin apple was found, surely there had to have been at least on other type of sweet apple growing in the wilderness of the East coast. It is averred to by historians over and over again that Europeans brought apple seeds and seedlings to Virginia first before these larger, sweeter apples made their way to New England. Let me set the record straight. ﻿﻿﻿﻿﻿Although we may give John Chapman(Johnny Appleseed)credit for spreading apple seeds in the central Atlantic coast and Illinois at the beginning of the 1800s, he is almost 2 centuries later than the original Johnny Appleseed, a man named William Blackstone. 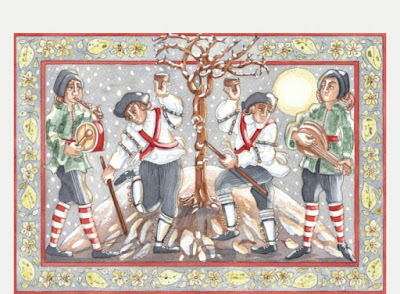 William arrived in late 1622, when the flood of Europeans was just starting to swell, and when he set food on this new land, he had crossed the Atlantic with a few pouches of apple pips(seeds). Starting on Beacon Hill in Boston, he traveled south to Rhode Island, burying these seeds along the way and once he reached Rhode Island, he began planting orchards there as well. The first type of apple planted by William? The Roxbury Russet! The main reason for him(as well; as all other planters)to start growing apples? For cider.It is amusing as to how William came across all these apple seeds. He simply started by saving all the apple cores from friends and family back in England, and even kept all the apple cores from his fellow ship mates on the way here. time) being planted in Virginia at the same time. In December, 1622, the Council of the Virginia Company in England addressing the Governor of Virgina, sent this communication on board either the Discovery, Bona Nova or the Hopewell. "Wee haue by this Shipp and the Discouerie sent you diurs [divers] sortes of seedes, and fruit trees, as also Pidgeons, Connies, Peacockes Maistiues [Mastiffs], and Beehives, as you shall by the invoice pceiue [perceive]; the preservation & encrease whereof we respond vnto you…"
The main reason, at the time, to transport beehives to this new land was for the growth of apple trees. Many historians will relate that even though apple seeds and saplings were brought to this new country, we didn't start growing apple trees for a number of years because there were no "white mans flies" indigenous to North America. "White man's flies" were what the Indians(according to Thomas Jefferson) called honey bees. We know that to be wrong now. The immigrants DID bring honey bees with them, for they knew that without honey bees, there would be no apples, hence no cider. And a Yankee with no cider is like a dog with no bark. There is record after record of "skeps" and "gums" being part of the store on board almost all ocean-born ships on their way to New England,. 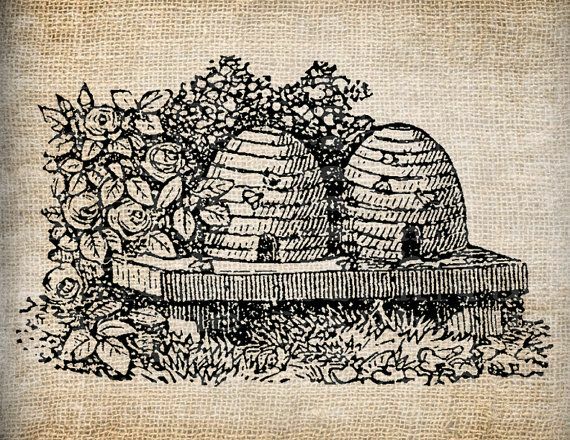 Skeps were simply woven, straw baskets with a dome lid(resembling a hive actually) that housed honeybees. The same with "gums". This was a more sturdy bee 'keeper' that was a 3 foot length of tree that was hollowed out almost all the way to one end, resembling a large pail. Plugging the open end once the bees were caught and placed inside, this would safely transport honeybees here to New England. "Vine-planters, wheat, rye, barley, oats, a hogshead of each in the ear: beans, pease, stones of all sorts of fruits, as peaches, plums, filberts, cherries: pear, apple, quince kernels: pomegranates, woad seed, saffron heads, liquorice seed, madder roots, potatoes, hop-roots, hemp seed, flax seed, currant plants, and madder seeds." 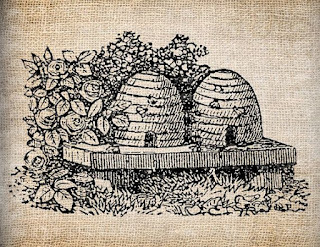 But no mention of bees, therefore it is only strongly speculated that the colony had their fair share of honeybees ready to pollinate." By 1640, apple orchards were everywhere throughout the land, and the Natives were beginning to understand the importance of this fruit as well. 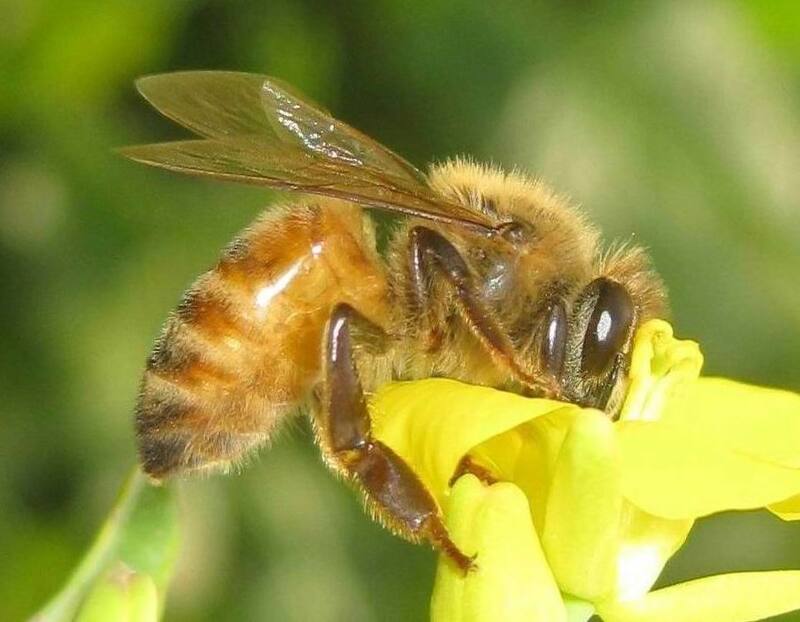 By 1650, the swarms of bees had made their way to Connecticut and Pennsylvania, pollinating many apple trees. Over the years, orchards were slowly becoming a business venture for some. In 1737, Robert Prince established the first apple orchard solely for commercial use in New York. It was so important of a crop that the British even posted armed guards around the perimeter of this nursery to prevent Americans from seizing it. It wasn't until the first quarter of the 19th century that the Pacific Northwest saw their own apple trees. A Captain Aemilius Simmons was given some apple seeds by a young lady in England to plant in this part of America. Some lore regarding apples are interesting to note as well. Apple boughs, much like pine boughs during Christmas, were hung above the entryway of homes to bless the family with good luck year round. Women used to cut apples cross-wise and offered one half to their prospective "beau to be", in order to hurry the attraction. -The Irish tradition of La mas nbbal(the feast of gathering apples) took place on Halloween, which included apple cider which had apples floating on top. People would take an apple out and eat if for good luck. 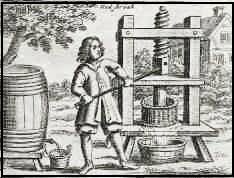 This was the beginning of Bobbing For Apples, commonly seen here in America to this day. "Here’s to thee, old apple tree!" Hats full! Caps full! Bushel-bushel-bags full! And my pockets full, too! Huzza!" As you do give them Wassailing." -Have you even heard of the term upper crust? That, too, is a Yankee original. 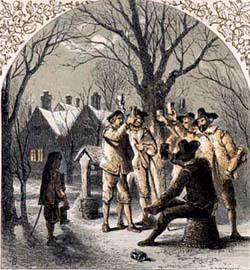 In Puritan times, when ground flour was not as abundant as decades to follow, crusts for pies was used in a utilitarian fashion. That is, only the bottom crust was made for an apple pie, to prevent sticking and to actually make a pie, rather than a concoction of stewed apples. Anyone lucky enough, or rich enough, to obtain more flour were able to form a top crust, or upper crust, for their pies. 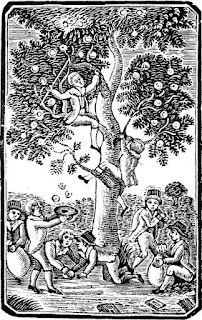 We all also know that the sole purpose of growing apples in the very beginning colonization of this land was for the cider but it was also a product of choice for bartering for other home staples when the need arose. 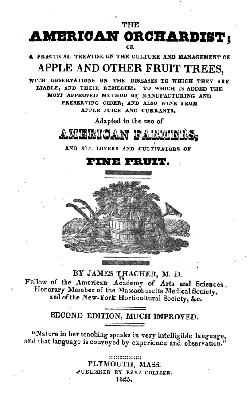 "Apples are still more various, yet rigidly retain their own species, and are highly useful in families, and ought to be more universally cultivated, excepting in the compactest cities. 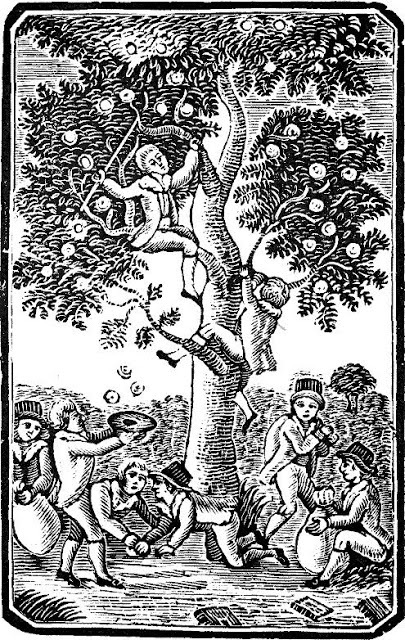 There is not a single family but might set a tree in some otherwise useless spot, which might serve the two fold use of shade and fruit; on which 12 or 14 kinds of fruit trees might easily be engrafted, and essentially preserve the orchard from the intrusions of boys, &c. which is too common in America. If the boy who thus planted a tree, and guarded and protected it in a useless corner, and carefully engrafted different fruits, was to be indulged free access into orchards, whilst the neglectful boy was prohibited--how many millions of fruit trees would spring into growth--and what a saving to the union. The net saving would in time extinguish the public debt, and enrich our cookery." "In the Autumn of 1793, I packed apples in the shavings of pine, so that they scarcely touched one another. They kept well till some time in May following; though they were a sort which are mellow for eating in December. Dry sawdust might perhaps answer the end as well. Some barrel them up, and keep them through the Winter in upper rooms, covering them with blankets or mats, to prevent freezing. 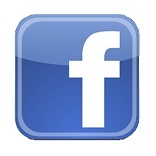 Dry places are best for them." Another utilitarian feature of apple cider was the storage. It was easily able to be kept all year round without fear of spoilage. "Cider may be kept for years in casks, without fermenting, by burying them deeply under ground, or immersing them in spring water; and when taken up the cider will be very fine. 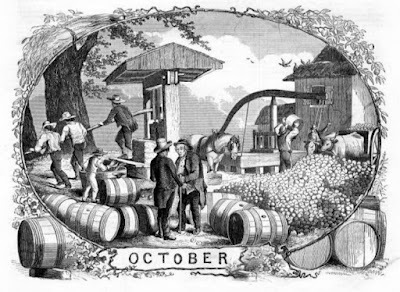 "A drink, called cider-royal, is made of the best runing of the cheese, well clarified, with six or eight gallons of French brandy, or good cider brandy, added to a barrel: Let the vessel be filled full, bunged tight, and set in a cool cellar, and in the course of a twelvemonth it will be a fine drink. If good rectified whiskey be used, instead of brandy, it will answer very well. "A quart of honey, or molasses, and a quart of brandy, or other spirits, added to a barrel of cider, will improve the liquor very much, and will restore that which has become too flat and insipid. To prevent its becoming pricked, or to cure it when it is so, put a little pearl-ashes, or other mild alkali, into the cask. A lump of chalk broken in pieces, and thrown in, is also good. Salt of tartar, when the cider is about to be used, is also recommended. "To refine cider, and give it a fine amber-color, the following method is much approved of. Take the whites of 6 eggs, with a handful of fine beach sand, washed clean; stir them well together; then boil a quart of molasses down to a candy, and cool it by pouring in cider, and put this, together with the eggs and sand, into a barrel of cider, and mix the whole well together. When thus managed, it will keep for many years. Molasses alone will also refine cider, and give it a higher color; but, to prevent the molasses making it prick, let an equal quantity of brandy be added to it. Skim-milk, with some lime slacked in it, and mixed with it, or with the white of eggs with the shells broken in, is also good for clarifying all liquors, when well mixed with them. A piece of fresh bloody meat, put into the cask, will also refine the liquor and serve tor it to feed on. A truly American dish is Apple Butter. It was a full day affair to put up a good amount of this tasty treat in the early days. Good, solid, blemish-free apples(much like the apples needed for cider) were ground by a homemade apple grinder that was powered by horse. This grinder was set on a wooden platform and as the apples were ground, the pulp was sandwiched in dried grass or straw. It was then covered with wooden planks and pressed to extract as much juice as possible. The pulp was given to their domesticated animals while the cider was boiled...and boiled...and boiled...in big copper kettles. When it was thick, it was placed in another kettle next to it over the fire while more cider was replenished in the large kettle. At the end of the day, when all the cider was boiled down to the consistency of molasses, sometimes even thicker, more apples were peeled, cored and cut up small to add to this thick "sauce". For the next 8-10 hours, whenever the apples boiled down to thicken this sauce even further, more cut apples were added, constantly stirring over the fire so it would not scorch. When the apple butter was dark brown and too thick to stir anymore, work was done. By this time the apple butter was said to be thick enough to slice and the sugar content allowed this apple butter to keep well over a year in their root cellar. At night take it out of the kettle, and set it in tubs to cool; covering it carefully. Wash out the kettle and wipe it very dry. Next morning boil the apple butter six or eight hours longer; it should boil eighteen homs altogether. Half an hour before you take it finally out, stir in a pound of mixed spice; cloves, allspice, cinnamon, and nutmeg, all finely powdered. When entirely done, put up the apple butter in stone or earthen jars. It will keep a year or more." 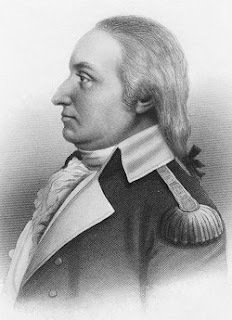 Another leading apple in New England was the Baldwin. 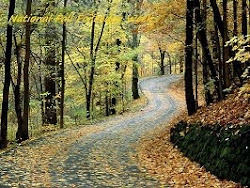 It remained revered by Yankees until the bitter cold winter of 1934, when well over a million trees succumbed to the bitter cold and died. The Baldwin apple was obtainable, but at a huge price. It was during this time that the current favorite among Yankees, the McIntosh, began to gain popularity. Massachusetts by Will Butler, the son of the original settler of that town. It was about 1725 that this tree was discovered right on his own lawn, and there sits a monument to this day commemorating it. Sadly, this tree fell in 1816, due to a gale. The Baldwin was originally called the Woodpecker, because the tree was filled with holes from woodpeckers. 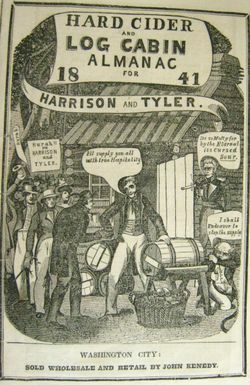 The name then changed to the Butters apple, after a certain Mr. Butters who purchased this farm a generation or two later. Mr. Butters gave one of these apples to Col. Loammi Baldwin, who propagated it and spread this perfect cider apple throughout Massachusetts. To add insult to injury, the bitterly cold winter of 1934 wiped out many of the apple orchards in New England, including the Baldwin. But for some reason, the McIntosh withstood this harsh winter and thrived to become New England's favorite apple. Find below, some of the most beloved of all New England apple desserts, from the very beginning..
Pandowdy, some say from pandoulde, meaning custard from a pan, was a popular New England dessert of old. The true meaning, however, comes from the fact that the top was dowdied, or cut up, after baking. "Hollingsworth [would] fill my plate from the great dish of pan-dowdy." 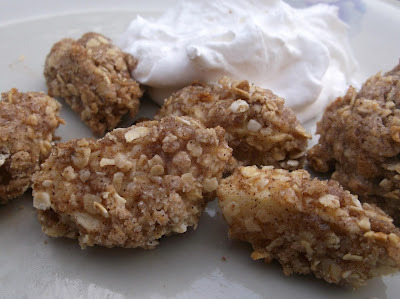 Apple Brown Betty uses bread as a crunch topping and is yet another Yankee original. See my recipe at theyankeechef.com. Apple Cobbler, again see theyankeechef.com, is so maligned that I fear the true preparation is lost. It should be baked with a biscuit topping, shaped to resemble a cobblestone street on top. Apple Crisp is generally made with a crispy rolled oat topping, but is equally pleasant with a flour/sugar/butter mixture. As long as it lives up to the moniker, crisp. Apple Grunts or Slumps is classically a steamed pudding, but now has transformed into a baked, or even stove top, dessert. As long as it lives up to the original meaning, it can be a true Grunt of Slump. The meaning? It was so named because of the grunt sound it makes when cooking or because it slumps down(reduces)when cooking. Apple Buckle is simply fruit and a cake mix stirred together and baked. 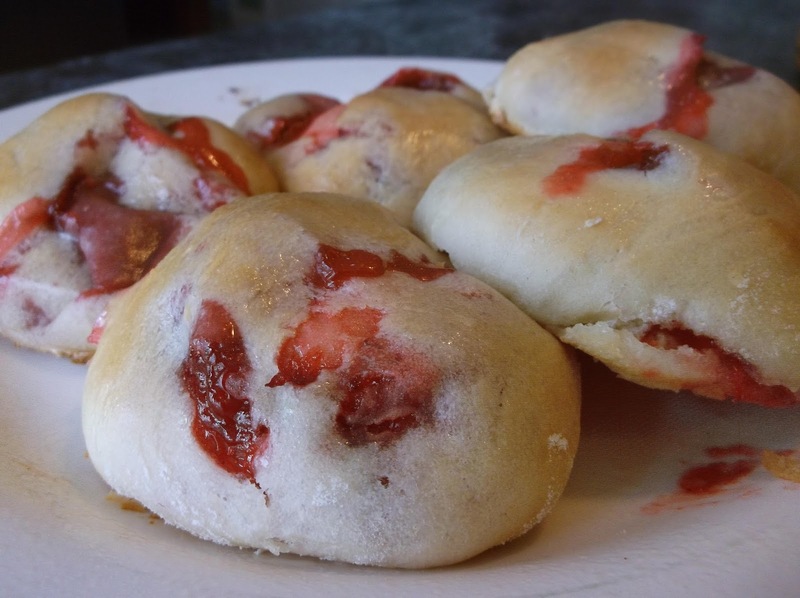 It is called Buckle because the dough seems to "buckle under", or give in to all the fruit while baking. Apple Charlotte. A tough meaning to convey so I will simply tell you that if it isn't made with bread, it isn't a true Charlotte. See my recipe at theyankeechef.com.